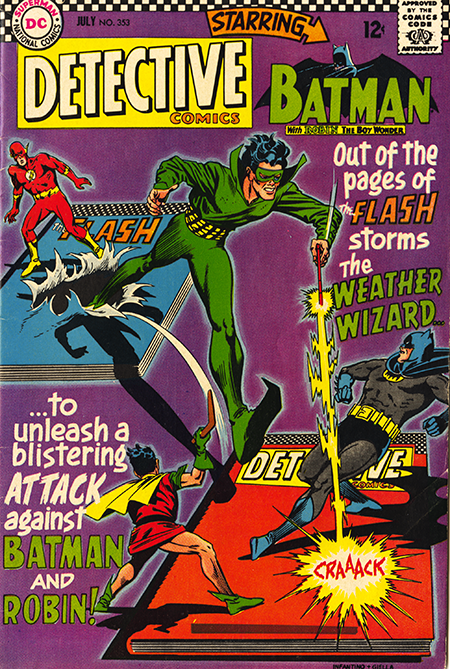 With a panoply of purple covers, the Flash was somewhat ubiquitous in the summer of 1966. 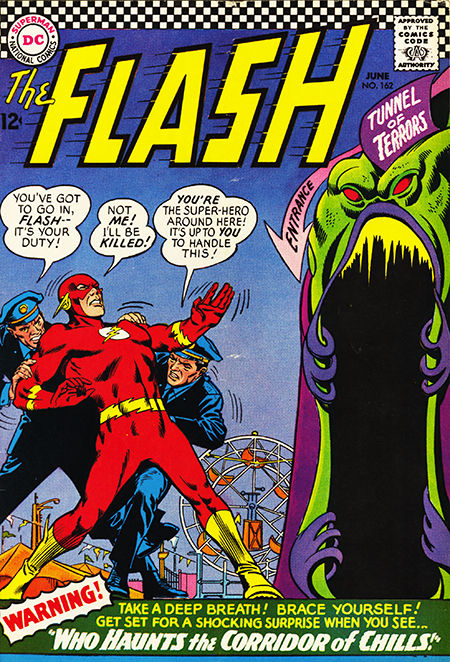 Issue #162 of The Flash presents another Gardner Fox scripted book-length story. It features a return of the Ornitho-Men who we first encountered way back in issue #125 in the “Conquerors of Time”. They were a race of bird people that Kid Flash had encountered when he traveled back in time. An alien scientist from the planet Koomool had been in contact with the Ornitho-folk and traveled to Earth to share knowledge wisdom with them. He arrived in the middle of an atomic war. He becomes buried alive in rubble only to be uncovered eons later when an amusement park is being built in Central City by the renowned showman Walter Dempsey. The park and its owner are a thinly veiled reference to Walt Disney and his legacy Disney World. It’s hard to really describe the massive influence of Disney and his brand back then, but it was an obvious and natural choice foe Fox. Seeing that would give me license to do similar things in Funky when my turn came. The alien scientist assumes it was the humans who had wiped out the Ornithos and he begins attacking the humans. This sets up the Flash’s battles with various elements of the amusement park. When the alien is finally outed and his story told, the Flash hops on the cosmic treadmill and travels to the past to find out what really happened and discovers the nuclear war back then was between factions of the Ornithos and that humans were not involved. The story ends with the alien promising the the planet Koomool and Earth will work together to make the universe a safer and better place to live. When Iris ask whether that is even possible the Flash responds that “If everyone cooperates, I don’t see why not!” Gotta love that sixties optimism, but we all know how that’s working out. That same summer an issue of Detective Comics came out that might as well have been an issue of The Flash. It had Infantino and Giella art, the Weather Wizard and our old friend the Elongated Man in the back-up story. The only thing missing was the Flash himself, but, for Flash fans, it was an unexpected summer treat.